January is always a time for reflection – reflection on the year past and the beginnings of a new year. What happens when you focus inwardly in the present? Ok, I have to admit I’ve been doing a lot of internal work this year which started with my birthday on the day after Christmas. I’ve been known to wake up in a dream-like state with an answer to a struggling art project or information on what I’m guided to do. On the morning of my birthday, information came thru alright – “do a vision quest with assistance from someone else. Oh, and do it soon!” Right, I just want, want, want to do a fast and be outside overnight in the cold – no, this idea did not speak to me. And, soon, felt like immediately, not 3 months from now. So, how to proceed? Luckily, my life-coach friend, Marian Baker, had contacted a group of us to do meditation together on December 27. My guidance was to ask her for references or assistance in some way. She surprised me and said, “I can help you with this.” This felt right – I’ve worked with her in the past and have made amazing progress. I still wasn’t clear on the how. What ended up happening was an internal vision quest with her guiding and questioning me on the way. Through this process, I made contact with my inner goddess who guides me with the courage to creatively produce my wearable art. My goal is that the wearable objects radiate empowerment and you become your inner goddess. Not exactly my picture of a vision quest, but certainly powerful with profound effects. And then, I followed it up with a longer hike which also held a surprise. I headed out in the middle of the afternoon ready for anything, right? Hiking boots tied on, extra layers in case it’s cold and water strapped to my waist. My idea was to take the Oso Ridge trail which crossed our sometimes river – and yes, the river is running now. So I had to skip over a few rocks to hit the trail. What I didn’t expect was how many switchbacks there were on this particular trail. I hadn’t climbed up like this in a while so I’m huffing along. And, now I’m peeling layers off cause it’s getting hot out here. I had to flee from a bicyclist flying down the hill – at least he was making all kinds of noise. And, then I saw a bench under a tree seemed like a good place to reflect and take a short break. After resting a bit, I decided to continue up the trail still wondering if anything profound is going to happen. A moment came where I wasn’t sure if I should keep going up or turn around. And then, I looked ahead and spotted a skunk with the brightest white stripe ever. That’s it, I’m outta here!!! I turned around quickly and headed back. And, just to be sure he wasn’t too close I looked over my shoulder only to see him following me. Can you believe it? Now I’m on the run!! Don’t know about you, but I didn’t want to be near it. I knew my hike was near the end, but honestly I didn’t really feel safe until I was off that ridge. 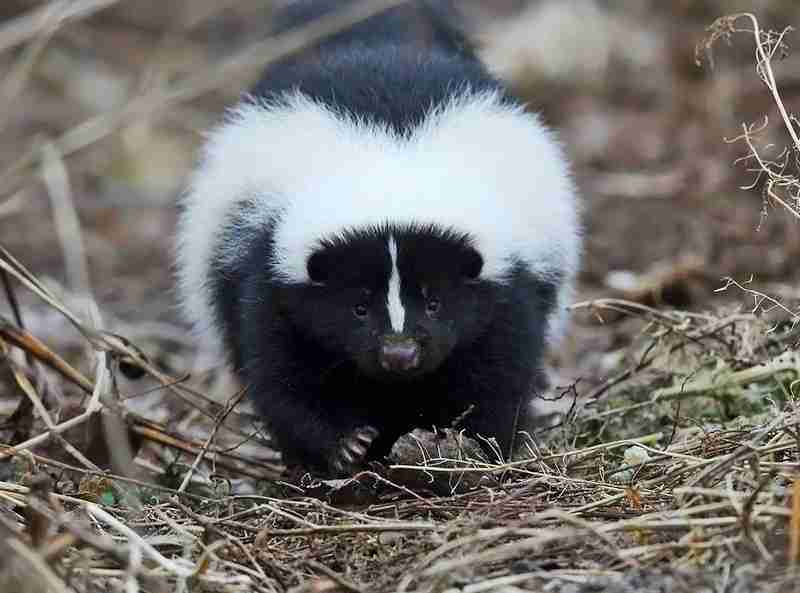 In all my hikes around here, I’ve never seen a skunk. Generally they’re out at night. Apparently when skunk energy comes in, you will receive and give respect. I certainly respected it! So, thank you for sharing yourselves with me; you are valued people in my life! May the new year bring in the gifts you are seeking. And, maybe I’ll see you at the upcoming Edwardian Ball in San Francisco based on the work of Edward Gorey. This is a ball – literally, a ball happens on Saturday night! Costumes, costumes costumes galore! Theatre productions! And, Art! See you! Great story, felt I was there! Wonder what you determined the skunk was there for?